My posts for Beginnings Baby garnered a great feedback from my readers. They were as enthusiastic as I am with the brand, so much so that I hosted two giveaways for Beginnings Baby. It’s so overwhelming to know that not only moms & dads want to win the starter kit set for their babies, but also Titas, Titos, Godmothers & Godfathers wanted to win it for their niece, nephew or godchild. Beginnings Baby & I are so thankful to everyone who participated. 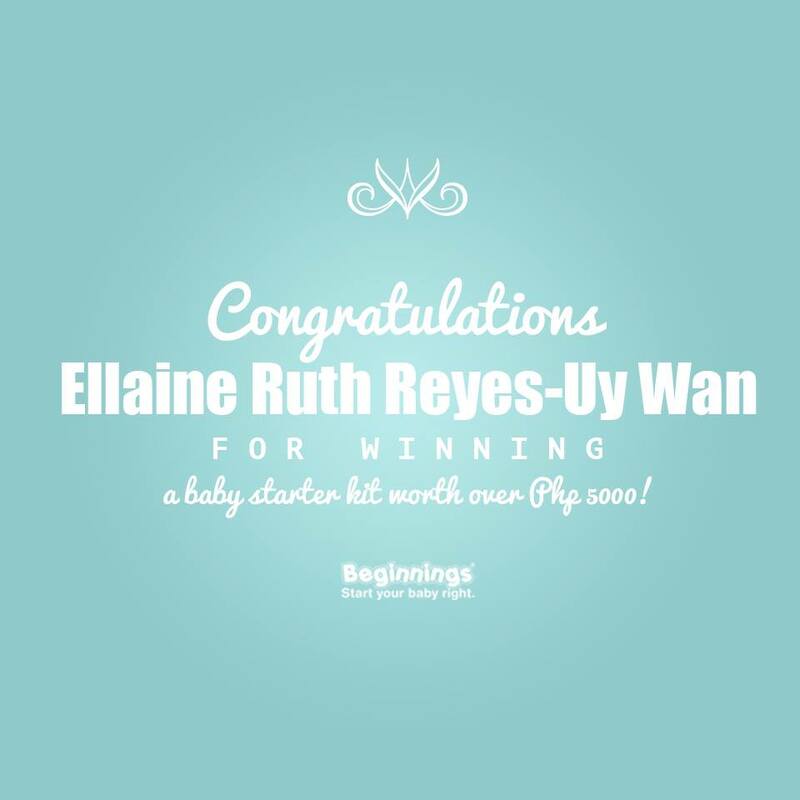 Again, congratulations to my Beginnings Baby giveaway winners! Congratulations Arjayssa & Ellaine! I hope you already know by now that you’ve won! Please check your email on how you can claim your prize. So excited for the both of you to drop by the SM Grand Baby Fair happening this weekend January 30, 31 and February 1, 2015 at the Mega Trade Hall of SM Megamall. Speaking of the SM Grand Baby Fair, did you know that during last year’s fair, Beginnings Baby (and it’s beautiful booth) had the longest line of all? There wasn’t a second that went by where you wouldn’t see a whole group of mommas-to-be filling their carts to the brim with Beginnings Baby products. This year, the all-white garments brand will be ready to serve you all again. Since they want you all to be winners, they’re willing to do another simple contest that’ll allow each and everyone of you to get a 20% DISCOUNT in all your purchases at their Beginnings Baby booth. All you have to do is like and share this post found at Beginnings Baby Facebook page. If this gets 2,000 likes and 200 shares, everyone who’ll shop at Beginngs Baby booth at the Grand Baby Fair will get 20% OFF! Lavett! This is the perfect reason to go shopping for Beginnings Baby garments at the SM Grand Baby Fair! I’ll make tambay (tambay talaga?) at the Beginnings Baby booth on January 30, Friday in the afternoon. I can help you decide and shop what you need for your baby. I hope to see you there!